Ss Joseph of Arimathea and Nicodemus: "we have heard of your faith"
This petition, with the responsibility it involves, also applies to another hunger from which men are perishing: "Man does not live by bread alone, but . . . by every word that proceeds from the mouth of God," that is, by the Word he speaks and the Spirit he breathes forth. Christians must make every effort "to proclaim the good news to the poor." There is a famine on earth, "not a famine of bread, nor a thirst for water, but of hearing the words of the LORD." For this reason the specifically Christian sense of this fourth petition concerns the Bread of Life: The Word of God accepted in faith, the Body of Christ received in the Eucharist. St. Jeanne Jugan: "children of the light"
Friday Wk 21: "the will of God, your holiness"
“Rabbi, you are the Son of God; you are the King of Israel." 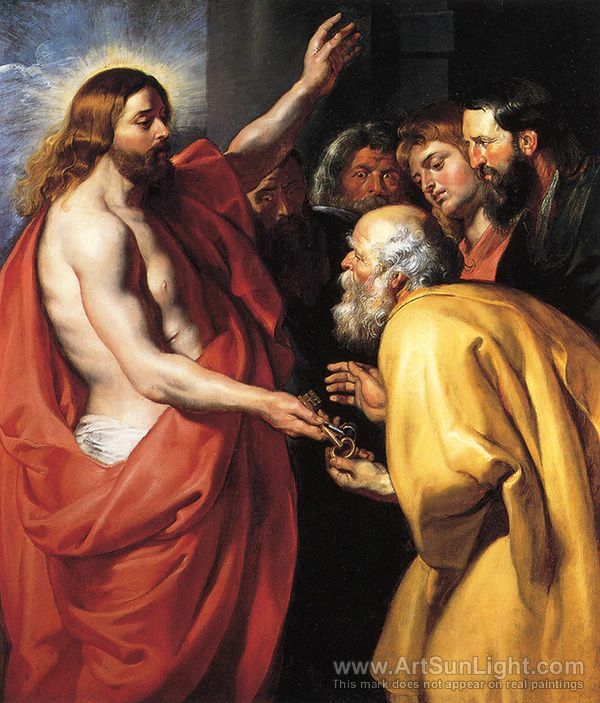 The title "Son of God" signifies the unique and eternal relationship of Jesus Christ to God his Father: he is the only Son of the Father (cf. Jn 1:14, 18; 3:16, 18); he is God himself (cf. Jn 1:1). To be a Christian, one must believe that Jesus Christ is the Son of God (cf. Acts 8:37; 1 Jn 2:23). The laws of physics are pretty predictable. The laws of human behavior, however, are not. Human reactions are sometimes entirely out of proportion to the event which provokes them. A reaction to a problem can present an entirely new problem in itself and sometimes may take the form of serious sin. Reaction to temptation which is consenting results in a cycle of frustration and unhappiness for the human person. In the first reading we see God's reaction to Shebna's lack of action: he wasn't fulfilling his office so God pulled him down and put another in his place. God's purposes have been fulfilled in salvation history through human beings who must freely cooperate with God's will, whose reactions must reflect God's action of revealing Himself in order to bring about His will that all men be saved. But God will not be frustrated and He perseveres in love to call men and women back to Himself. God's reaction to sin is always perfect and proportionate in forgiveness. But His grace is always superabundant: through His divine mercy grace is given to forgive and also to begin a process of healing from the effects of sin. We see in the Gospel that through Christ the will of God for our salvation finds new impetus in a new office conferred upon Peter, whose new name reflects his mission: Peter is the Rock. 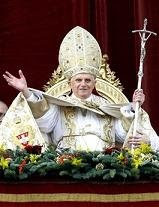 He will serve as a foundation for God's plan in history which now takes place through the Church. How will this happen? God's mercy will be the holy and proportionate reaction to the sinful actions of men and women. God will stop the cycle of unhealthy reactions through the ministry of reconciliation conferred upon Peter to "bind and loose". The gift of the priesthood received through Peter and the apostles for the forgiveness of sins takes place particularly in confession. The holy reaction of God to forgive when we act sinfully continues His mission to save the world. Sin if serious results in the loss of baptismal grace and if unrepented can result in eternal separation from God. The office of binding and loosing refers also to the forgiveness of serious sins after our baptism. All of us at one time or another have frustrated God's plan for us through our sinful reactions to temptation. When we sin in a grave or serious way we cannot receive the Eucharist worthily or in a holy way but rather commit another sin: that of sacrilege. Confession is thus necessary after mortal or serious sin before returning to regular reception of the holy Eucharist. Our reaction to sin must be the holy and healthy action of seeking sacramental confession at the earliest opportunity. In order to allow God's plan to be fulfilled we must go to the office of Peter in the Church, we must have the help of God whose reaction to sin is always an action of love: healing and forgiving grace. 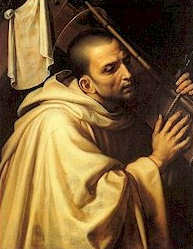 Saint Bernard: “The greatest among you must be your servant." Friday, 20A: "You shall love the Lord"
Jesus said to his disciples: "Love one another even as I have loved you." Thursday, 20A: "you came in here without a wedding garment?" Wednesday, 20A: "Are you envious"
... because I am generous? The tenth commandment requires that envy be banished from the human heart. Pundits and experts are saying that there is a parallel between the fall of Western economies and children's reading and learning scores. The sense of entitlement that has been bred over many years in these countries, they say, is reflected in the lack of a work ethic among the young now observable in poor educational results and the rampant violence in the streets of Britain and which now may be spreading to other places. Having been given so much and worked for so little has aroused in some an addiction that must be fed through rioting and looting. 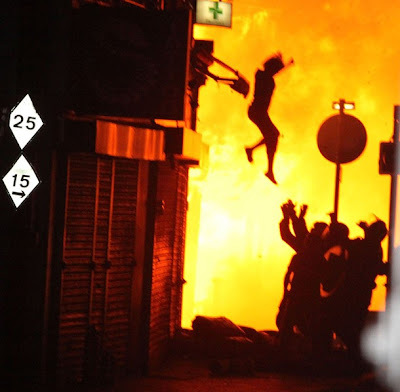 In the burning and destruction of the property of others is a rejection of the society to which they once looked so expectantly to give them everything they lack little effort on their part. The false illusion of the "miracle" of free stuff leaves the human person weakened and vulnerable before the harsh reality that work and discipline is a fact of human existence, exempting no one from its laws of give and take. Have you ever heard someone say "I don't get anything out of it" when asked why they no longer attend Mass regularly on Sundays? Perhaps it is a sense of entitlement on the part of individuals on a spiritual level that leads to such an attitude. The thinking might be that if God is all powerful and capable of miracles and I give Him what He wants by keeping the commandments, among them the law of keeping holy the Lord's Day each Sunday, then I am entitled to expect Him to give me everything I want, including meeting my expectations of what I should get out of attending Mass. Everyone dreams of miracle bailouts: materially by winning the lottery or spiritually by having all their dearest prayers answered. But the fact is that the God of the extraordinary and the miraculous chooses normally to work through the ordinary and the mundane. And this is the greatest miracle of all: everyone without exception is called to find what he or she needs in Christ who makes Himself radically available in the universal Church, the ordinary place of faith. James Joyce once famously described the universal Church thus: "Here comes everybody". Increasingly it is the Church which serves as a unifying force in societies with a growing interracial and multicultural face, as was evident recently after the senseless violence in Norway when the Catholic Church offered a place of prayer and consolation for the grieving from diverse languages and backgrounds. Immigrants from diverse backgrounds recently filled the streets of London to overflowing to welcome the Holy Father during his visit there. But though all are called, it is the through the ordinariness of their lives that God makes extraordinary possibilities take on flesh through Christ. The Church is "the place of faith" where this great work of God is done in us and through us; "the house of prayer for all peoples" (Is 56:1, 6-7) where anyone from anywhere can meet, know and love God. All were dead because of sin but now, through the mercy of God, all are able to live in Jesus Christ whose "ordinary" death on the Cross won for us the extraordinary gift of God's own life opened for us through His merciful love. "For the gifts and the call of God are irrevocable. they too may now receive mercy." It is through the ordinariness of obedience, the keeping of the Commandments, that God does what is extraordinary for mankind by the grace of faith. Christ is the "gift" that opens up the possibility of God in the lives of everyone, and each of us. The most ordinary task of keeping God's law, of doing what is right, just and good, is the great miracle of the extraordinary for every human person called to life of faith in the universal Church. The Canaanite woman in the Gospel approaches Christ not with a sense of entitlement but rather with humility. And the Lord makes clear that she indeed is not entitled to demand what must remain sheer gift: "it is not right to take the food of the children and give it to the dogs". Despite odds which might discourage many she perseveres in the humble prayer of faith and thus gains access to Christ and the gift of an answered prayer. God Himself, His own love and presence are "revealed", made real again and again, for us and others in a continuing miracle of goodness when we do what is just, right and holy for love of God who revealed His law of love most fully in Christ who obeyed the Father unto death on the Cross. Sunday is the most miraculous of days when we, though many, are called forth from many different lives and from many different places, to be truly one in Christ. Let us never take this miracle for granted by overcoming even the greatest of inconveniences in order to be here again next and every Sunday so as to start an ordinary week once again in the most extraordinary of ways: gathered in the miracle of true oneness around the one Lord who took on the ordinariness of human flesh to change us so that we might share forever in the miracle of the extraordinary, eternal life of God. 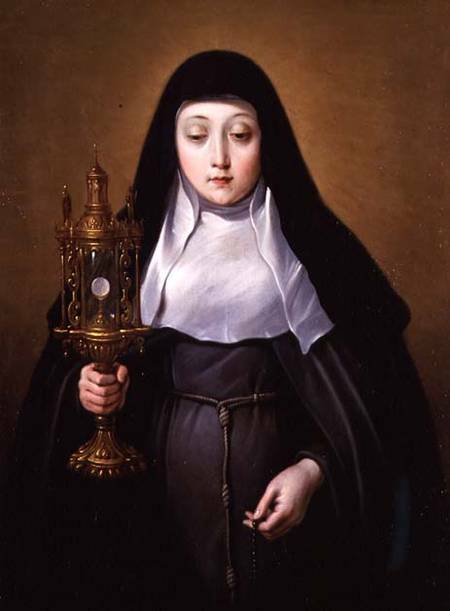 Ss Pontian, pope and martyr, and Hippolytus, priest and martyr: "they will also persecute you"
Saint Clare: "the glory of the LORD left the threshold of the temple"
while up above them was the glory of the God of Israel. Worship of the Eucharist. In the liturgy of the Mass we express our faith in the real presence of Christ under the species of bread and wine by, among other ways, genuflecting or bowing deeply as a sign of adoration of the Lord. "The Catholic Church has always offered and still offers to the sacrament of the Eucharist the cult of adoration, not only during Mass, but also outside of it, reserving the consecrated hosts with the utmost care, exposing them to the solemn veneration of the faithful, and carrying them in procession." 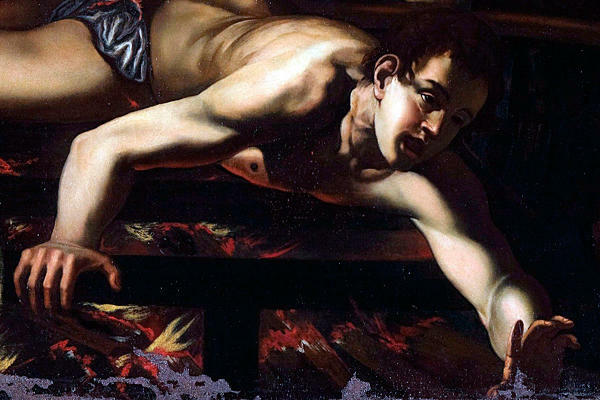 Saint Lawrence, deacon and martyr: "God loves a cheerful giver"
Unless a grain of wheat falls to the ground and dies, it remains just a grain of wheat. But if it dies, it produces much fruit. The sacrifice of Jesus "for the sins of the whole world" expresses his loving communion with the Father. "The Father loves me, because I lay down my life," said the Lord, "(for) I do as the Father has commanded me, so that the whole world may know that I love the Father." Tuesday, 19A: "It is the LORD, your God, who will cross before you"
Finally, the church has an eschatological significance. To enter into the house of God, we must cross a threshold, which symbolizes passing from the world wounded by sin to the world of the new Life to which all men are called. The visible church is a symbol of the Father's house toward which the People of God is journeying and where the Father "will wipe every tear from their eyes." Also for this reason, the Church is the house of all God's children, open and welcoming. In the Roman liturgy, the Eucharistic assembly is invited to pray to our heavenly Father with filial boldness; the Eastern liturgies develop and use similar expressions: "dare in all confidence," "make us worthy of. . . . " From the burning bush Moses heard a voice saying to him, "Do not come near; put off your shoes from your feet, for the place on which you are standing is holy ground." Only Jesus could cross that threshold of the divine holiness, for "when he had made purification for sins," he brought us into the Father's presence: "Here am I, and the children God has given me." Our awareness of our status as slaves would make us sink into the ground and our earthly condition would dissolve into dust, if the authority of our Father himself and the Spirit of his Son had not impelled us to this cry . . . 'Abba, Father!' . . . When would a mortal dare call God 'Father,' if man's innermost being were not animated by power from on high?" There are so many fears: of heights or depths, of close spaces or open spaces, of crowds or loneliness. There are almost as many kinds of fear as there are people. Some fears can be debilitating and require years of therapy or are kept manageable only through medication and close supervision. What do you fear? If you are like most people you probably have a very deep respect for the powers of nature, such as the earth, wind and fire. In the case of these fear can be a very good thing because it can save our lives. The powers of nature threaten us with death and perhaps we sometimes are fearful because we suspect we may not be ready to meet God and are afraid of punishment. There is another kind of fear about which we learn in today's Scriptures that can save our eternal life: fear of God which is that "love for Him who commands". This kind of fear is not at all like a cowering before the powers of earth, wind and fire or a "servile fear" of punishment which is lacking in love and trust. In the first reading from the Old Testament Elijah on Mount Horeb finds that these "salutary" or life-saving fears of the powers of nature are eliminated as ways of finding or knowing God: God is not in the earthquake, in the fire or in the wind. Where is God? In something so small it takes very great attentiveness, listening and presence to find him: in "a tiny whispering sound". This does not inspire fear as do the powers of nature and is so small as to be easily missed or mistaken for something very unlike those things we think of as God: small, insignificant, only noticed with great effort. And yet, because Elijah withstood the fears inspired by the destructive powers of nature did he survive to hear the voice of God and to have direction for his mission as a prophet. We sometimes feel as though we are surrounded by things that make us fearful and we are sometimes tempted to think that if God is great like the things He has made that we must also appproach Him through fear. 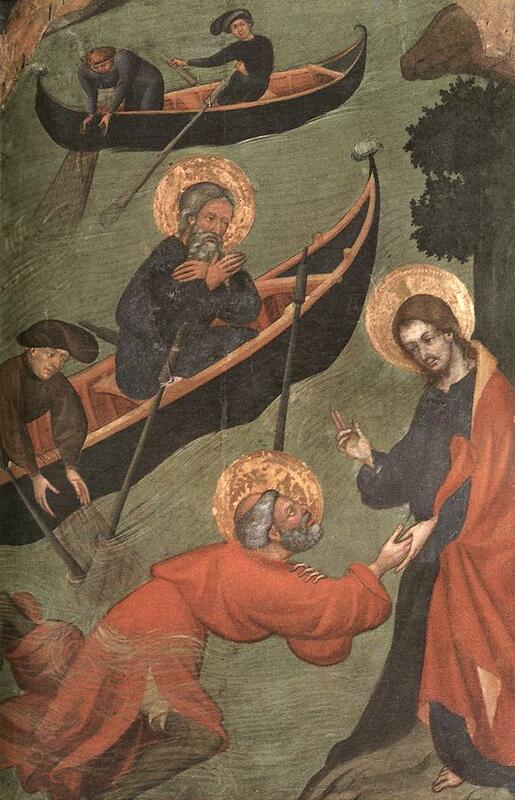 In the Gospel Peter is invited by the Lord Himself to approach the divine Presence on the water and he starts out well. It is only when he gives in to fear of the power of the wind and the waves that he also finds himself unable to approach God. 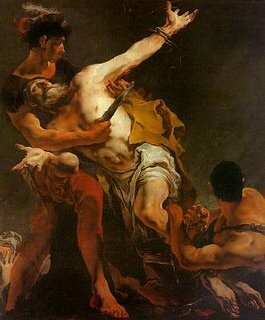 Peter succumbed to the kind of fear which does not help but rather hinders our access to the Lord. Whatever the fears that frustrate a faith which enables a loving trust, a holy fear of God, we must ask His help to eliminate and overcome them so that we can live a joyful and fulfilling life. Only when fear of the things God has made is overcome by the power of loving Faith will we be able like Peter to "walk on water", fully unleashed to love the uncreated God who made the earth, the wind and the fire. We must ask for the grace of conversion. That still, small Voice, so hard sometimes to hear, is Present in the holy Eucharist, calling us with the same Divine Love that Elijah and Peter discovered. The holy Mass is our opportunity to practice a holy listening, to offer the gift of an attentive presence to God, and so be rewarded with the experience of growing closer to Him in the love and trust of holy fear which make our hearts capable of holding God's love. 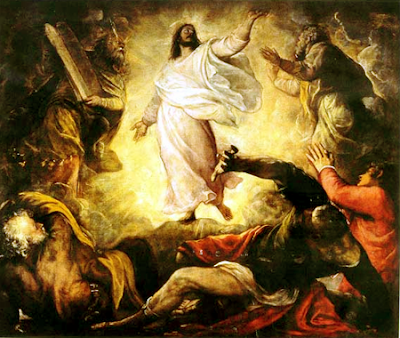 The Transfiguration of the Lord: "the Ancient One took his throne"
His clothing was bright as snow, and the hair on his head as white as wool; his throne was flames of fire, with wheels of burning fire. A surging stream of fire flowed out from where he sat; Thousands upon thousands were ministering to him, and myriads upon myriads attended him. The court was convened and the books were opened. Peter did not yet understand this when he wanted to remain with Christ on the mountain. It has been reserved for you, Peter, but for after death. For now, Jesus says: "Go down to toil on earth, to serve on earth, to be scorned and crucified on earth. Life goes down to be killed; Bread goes down to suffer hunger; the Way goes down to be exhausted on his journey; the Spring goes down to suffer thirst; and you refuse to suffer?" 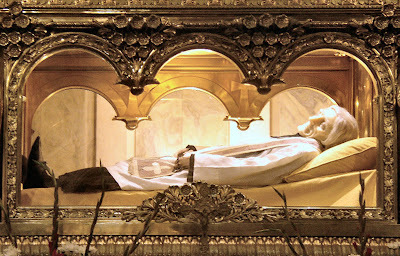 Friday 18A: "hear the voice of God"
Saint John Vianney: "assemble the community"
Photo: Tomb of Saint John Vianney in Ars, France. Wed, 18A: "Have pity on me, Lord"
... will be called greatest in the Kingdom of heaven. Moral conscience, present at the heart of the person, enjoins him at the appropriate moment to do good and to avoid evil. It also judges particular choices, approving those that are good and denouncing those that are evil. It bears witness to the authority of truth in reference to the supreme Good to which the human person is drawn, and it welcomes the commandments. When he listens to his conscience, the prudent man can hear God speaking.